Something you don’t ever want to hear on a boat is the sat phone ringing in the early hours of the morning. Only our close family have this number and it is likely to be bad news. Our minds were reeling as we missed the call and sent a message to call us on our New Cal mobile number. Our parents are getting old and have had health scares and Bruce’s brother in law Guy is fighting cancer, and this was all going through our heads as we waited. I answered the phone with trepidation and it was my sister Jacqui: “Tim is dead”. No, not Tim! My brother Tim is 55 and was in very good shape health wise, this was a total shock and we were numbed with a mix of denial and grief. Suddenly our beautiful surroundings and adventure meant nothing at all. On Wednesday the 16th of September the forecast was for a moderate North Easterly wind which we planned on using to sail the 40 miles from Prony Bay to the Isle of Pines. We motored for a short while until the breeze filled in and we started sailing on a pleasant 60 degree wind angle. “Insatiable 2” and a catamaran named “Impi” left shortly after us. I2 was really quick on this wind angle and Jim slowly reeled us in, eventually taking a comfortable win in race 2 of our series as we enjoyed a building breeze but quite nice flat water in the lee of the lagoon reefs and islands on the way. It looked like there were many good surf-able waves breaking on the reefs, but we weren’t close enough to tell for sure. The highlight of the trip was seeing a pod of whales really close to us as we passed Du-Ami isle, which was very exciting as this was the first whales we had seen since leaving Sydney. We arrived in the stunning Kuto bay in the late afternoon and found a spot to anchor amongst about 10 other cruising yachts, the most we have seen in one place so far this trip apart from in Noumea. We took the dinghy ashore for a quick look around and a sundowner on the beach. Kuto has a magnificent white sand beach and is one of the most beautiful bays we have come across, the resort, wharf and other civilization does not detract too much from the natural beauty. As we were drinking our sundowners on the beach we watched the catamaran “Impi” pull up their anchor and move from their spot close to the beach to far out in the anchorage. It seemed a strange thing to do as they had been securely anchored in a good spot. We later found out that there had been a Tsunami warning on the radio (earthquake in Chili) which our friends on I2 were trying to relay to us. Later that night it was downgraded, but we slept soundly, blissfully unaware of the possible danger. In the morning there was much excitement as we spotted a manta ray in the anchorage. It is Lyn’s dream to swim with a Manta so she jumped in with snorkeling gear but didn’t manage to intercept it. We went ashore for a walk to search for a man named Gaby who runs a camp ground at the adjacent bay and is touted by Lonely Planet as the man to talk to for permission to kite surf here. For some reason the local Kanaks generally don’t allow kite surfing around the Isle of Pines. A sudden downpour had us sheltering in a bus shelter for half an hour. Gaby was away but we did enjoy a walk around his beautiful camping ground and meet a litter of very cute puppies. We then hiked up Nga peak where you have stunning 360 degree views of Kuto and the whole island. On Friday the 18th we decided to motor Jolifou a short distance around the corner to the town of Vao so that we could visit the market and stock up. It was a somewhat tense passage as we had the sun in our eyes and couldn’t see the shallow reef very well as we followed the waypoints provided in the cruising guide. Our efforts were rewarded by a really scenic large shallow sandy anchorage area, good for our shoal draft, and we were the only boat there. We took the dinghy to the beach at the recommended landing place, admiring the pretty gravesite carvings, and walked up the most charming street with quaint houses, puppies and children playing in the street. Vao has a lovely laid back friendly feel to it. The market was nice and although we got there a bit late and stocks were low we were able to buy some good fresh veggies, and then some baguettes from the general store down the road. On returning to Jolifou there were a couple of the beautiful Pirogue boats arounds which the locals use to take tours through the nearby Upi Bay (locals only in this bay, no yachts or dinghies). We returned to Kuto, where we found the anchorage was filling up with a few more Island Cruising Association (cruising rally) boats arriving. Bruce took the dinghy and his surfboard to see if he could find a wave to surf on the reef out towards Moro Island. There was potential, but in the end he decided not to take the chance on his own and a long way from the anchorage. We went for a paddle board around Kuto bay and spotted the manta ray again. Bruce stayed with it while Lyn rushed back to the boat to get her face mask. Finally Lyn fulfilled her dream, swimming with this beautiful manta for ages, diving down and touching it, and even “dancing” with it as it rolled onto its back and vertical and waved its wings. A truly memorable experience! Bruce had a go too and also enjoyed its company for a while before we returned to the boat, freezing cold. To cap off a great day, Akimbo arrived as the sun was setting and we celebrated the occasion with drinks on I2. Next day we decided to paddle the standups over to Gaby’s beach. On the way we stopped by “Impi” and said hello. As expected from the name, there was a South African connection. Brent and Anna are lovely people. Confessing to be out of alcohol (Isle of Pines is a dry island), they asked us around for a cup of coffee at sunset. At Gaby’s campsite we were delighted to meet the man himself as well as a lovely Australian lady named Lisa who entertained us with stories of her passion for the island and her “retirement project” to help with infrastructure and social problems. Gaby was most accommodating with his beach, describing the surf spot when the swell is up and absolutely happy with me kite surfing there. He has built an amazing campsite here and is clearly an energetic and fun character. We highly recommend his campsite (Camping Les Rouleaux) to any traveler to the island. We are not the “coffee at sunset” types, so arrived at Impi with a bottle of cold bubbles and some beers to share. I think this has bought us friends for life! We had a hilarious evening exchanging life stories and it was great to enjoy the South African sense of humour which Brent abounds in. Anna is actually not South African, but is Flemish Belgian, and speaks fluent French which is a huge advantage in this part of the world. Brent got fed up with the black empowerment policies being imposed on his successful company in Cape Town and wound up the company, bought Impi (a Lagoon 45) and they have been cruising for four years. They are very keen scuba divers and have an excellent blog site and YouTube channel where Brent is constantly putting up interesting and entertaining videos. He is really clued up on the latest navigation software and safety technology and we learned a lot from him in a short space of time. 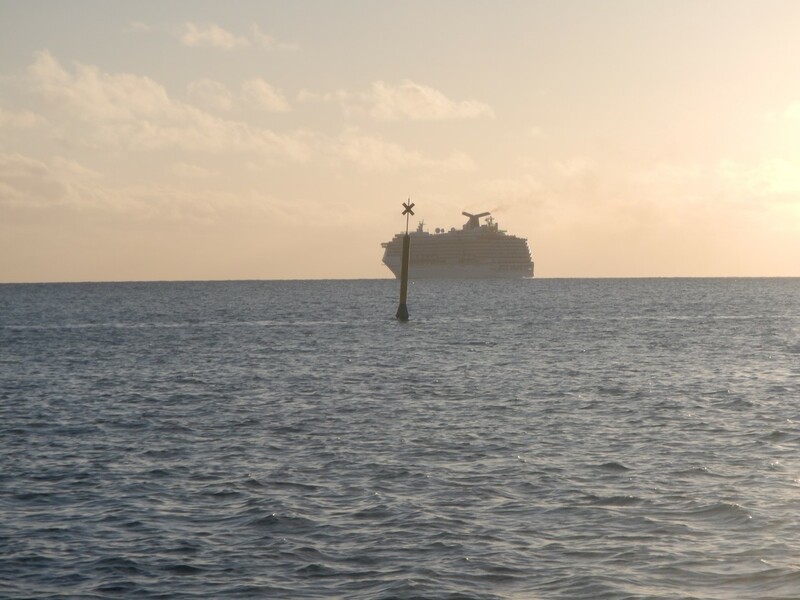 On Monday a huge cruise ship arrived, along with all the fake trappings ashore. We feel really blessed to be able to enjoy this place without the crowds that cruise ship passengers are obliged to always take with them to paradise. 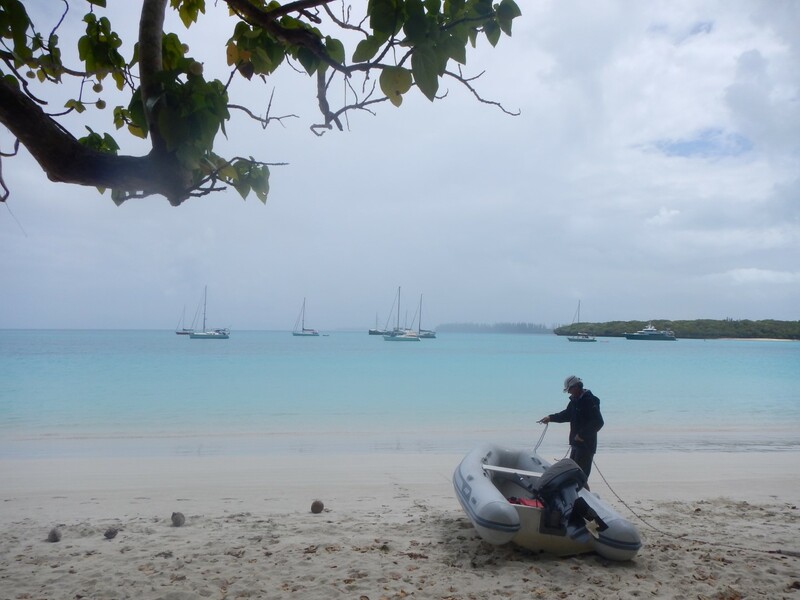 In the afternoon the wind was up and Lyn dropped Bruce off in the dinghy at Gaby’s beach for a kite surf. It was great fun, an excellent spot for it but the wind started to get a few holes in it so it was a bit of a curtailed session. That night our new friends Brent and Anna from Impi came to Jolifou for dinner. 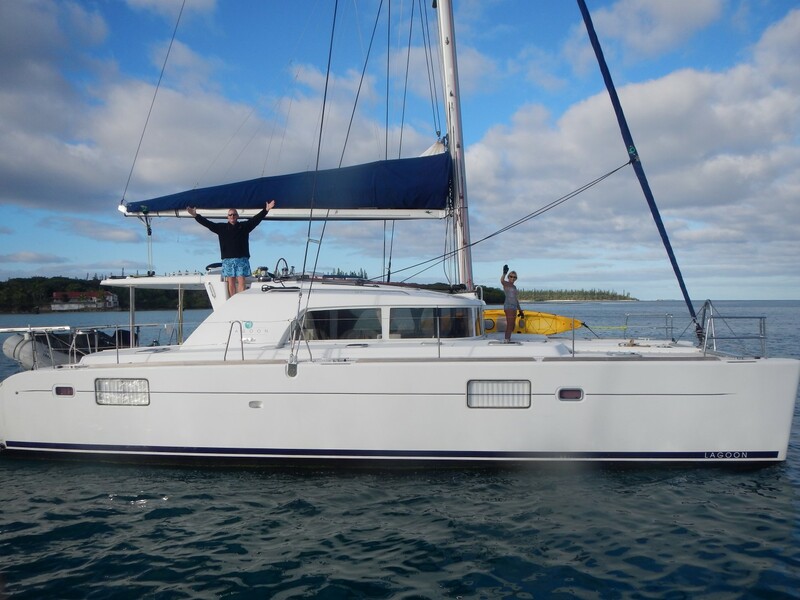 We discussed going diving together at Gadji on the other side of the island, but unfortunately they had to head for Noumea where they were taking delivery of a new sail and need to start looking at a weather window for departure to New Zealand. We have vowed to get together again next season. Kuto is not a good place to be when the wind is from the South West as the swell and waves come directly into the bay. There are also not many good options for Westerly wind anchorages around the island so with a forecast of South Westerly winds for Thursday our friends on Insatiable 2 and Akimbo elected to return to Prony Bay on the main island. We chose rather to head up to Gadji on the North West tip of the Isle of Pines, where there is a shoal draft anchorage sheltered from all wind directions and some excellent dive sites. We decided to take the inner Western passage to Gadji, which is really shallow and tricky, winding between shallow reef and coral heads. Fortunately we had a detailed waypoint route to follow, but Lyn was on the bow the whole way, calling the shallow spots. We enjoyed a brief lunch anchor and rest at Ouameo Bay before tackling the most hairy section as we entered the anchorage area from the Southern approach. Our efforts were rewarded as we found ourselves alone in an absolutely idyllic setting, a cozy sand bottom anchorage of 1 to 2 meters deep surrounded by beautiful beaches and little mushroom shaped islands. We took the dinghy over to a little beach and enjoyed one of our most beautiful sunsets to date. On Monday we paddled the standups to explore the outer reef islands north of the anchorage, investigating possible scuba spots. There is very little available in the way of scuba guides for New Cal but Bruce had photographed an old French guide book from the library and we knew the approximate location of a dive called “The Caves of Gadji”. We located what we think is the start point for this dive and then paddled along the drop-off of the reef and then back in through a very shallow reef pass, with Bruce catching a little wave, then falling off and having to dive for his sunnies! In the afternoon the wind had got up and we decided to shelve diving plans for the day. Next morning was beautiful, sunny and still so we decided to use the opportunity to paddle and explore the little islands to the west of the anchorage. Most of the islands and rocks here are overhanging mushroom-like shapes with interesting secret little beaches, gullies and caves along their low cliff shores. It was a lot of fun paddling close along the edges and peering into the caves. In the afternoon we took our snorkel gear and the paddle boards to the outer reef and had a bit of a snorkel along the drop-off, saw a few sharks and some very pretty fish. We look forward to scuba diving here in the future. At about 2AM on Wednesday the 23rd of September we got the phone call with the tragic news about Bruce’s brother Tim. He was a very healthy man, just 55, and yet had passed away in his home with a suspected heart attack possibly caused by a nerve disorder. This was such a shock to us all, and his poor wife Pauline was in South Africa at the time visiting her ailing parents. We needed to get back to Noumea and fly to London as soon as possible to support Bruce’s parents and Tim’s family. Unfortunately the wind was blowing quite strongly from the North West, exactly the wrong direction for sailing to Noumea. We decided to wait for better winds rather than risk damaging the boat and spent the rest of that day and the next making arrangements for the boat, flights etc., grieving and coming to terms with the shocking news. On Friday the wind was a little lighter and had swung to the West more. Still not great conditions, but we decided to head for Noumea anyway. Departing at first light with a falling tide approaching half tide we picked our way through the western entrance to the anchorage with a few very shallow moments. The course to Woodin channel was close-hauled on port tack and we used the staysail and double-reefed mainsail. On the way Lyn was finalizing our arrangements, waiting on confirmation from Port Moselle Marina that we could leave the boat there because our flight bookings depended on this. Eventually they confirmed we could leave the boat there, BUT would need someone to move it to a different berth whilst we were away. Pete and Ness suggested we ask a good friend of theirs, David Plumley, whom we had met briefly. David was our hero, agreeing to move the boat in our absence and also arranging with the Marina, coming down to see how the boat worked etc. 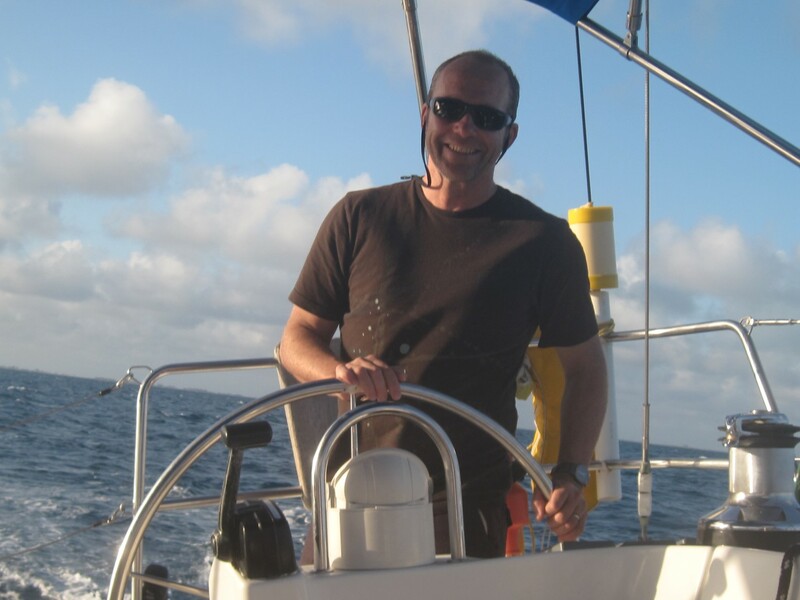 We didn’t want David to have to be responsible for the boat whilst we were away, so we also asked Chloe from Noumea Ocean Services who agreed to do this at a really low price. We highly recommend her to any cruisers who might be reading this. From Woodin channel we motored and motor-sailed. The current was with us and against the wind through the channel and there was really rough waves on the exit of the channel. After a very long day of sailing and stressful organizing we arrived at Noumea just after dark, parked the boat and started the big tidy up. Exhausted but more relaxed now that we were safely docked, we noticed that our friends Brent and Anna from Impi were also on the dock and had a nice drink and catchup with them. The airport shuttle was picking us up at 9:30 in the morning so it was a quite frenetic morning securing the boat away, meeting up with David and Chloe and packing. Then it was a very long and sad trip to London via Sydney and Dubai. I won’t write much here about our time in London. We were very glad we both went, for ourselves and to support the family. It was so good to re-inforce our bond with Tim’s family who are devastated but drawing strength from their love and closeness with each other. We had not seen them for much too long and it is such a regret that we didn’t do this whilst Tim was there. It was also good to see how loved Tim is, so many friends genuinely grieving at this loss. The memorial and funeral were truly beautiful and fitting for such a great man. I may post my eulogy to Tim on another blog post if I feel I can do him justice. By jolifou in Uncategorized on October 19, 2015 . Beautiful blog and tribute to Tim………thank you both for sharing all these beautiful memories of your amazing adventures……..Love you both so much….